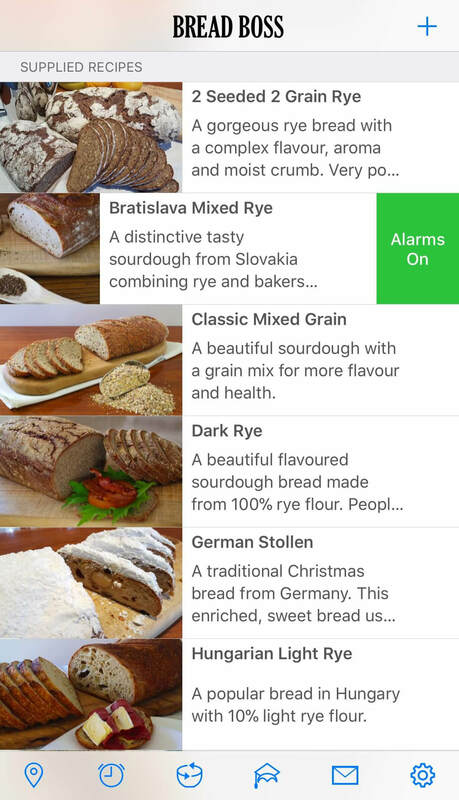 The main screen for the Bread Boss app is the list of recipes, both supplied and those created by you. The recipes with active alarms will be at the top, your recipes will follow in alphabetic order and the supplied recipes below that. 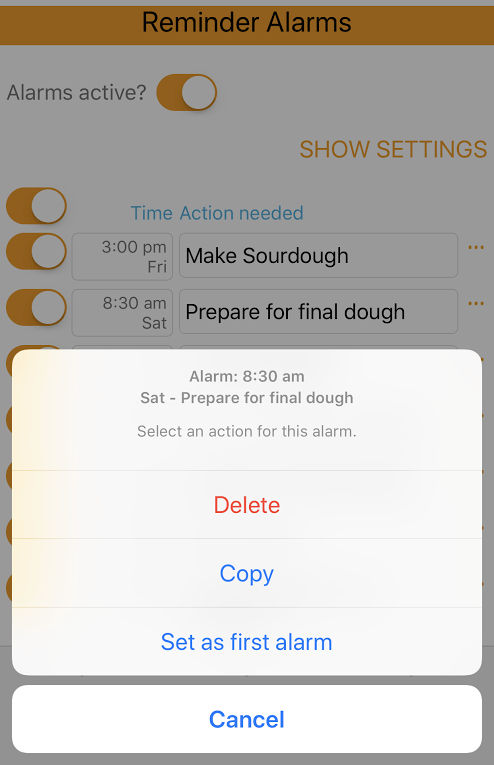 You can swipe to the left on a recipe to get a list of some of the actions to perform against that recipe for example Turn Alarms On/Off or Delete a Recipe. Getting Started – a quick overview on the app. 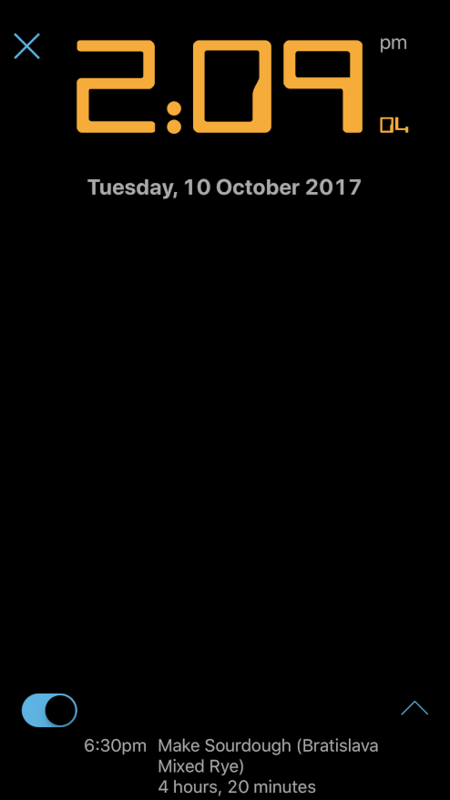 Clock – shows you the current time and the list of alarms currently active. Refresh starter – shows you how to refresh your starter. Tutorial on how to use the Bread Boss app. Send feedback – launches your email app to allow you to send any suggestions or ideas our app email address BreadBossApp@gmail.com. 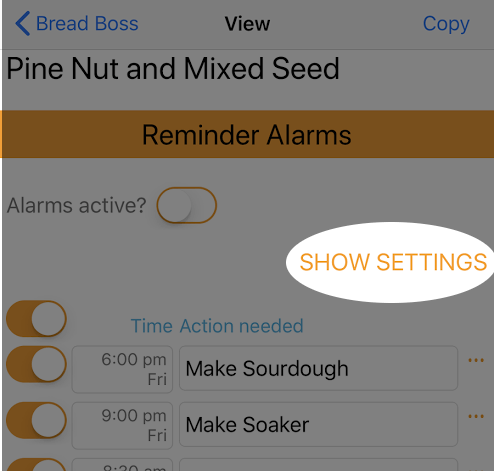 Settings – allows you to change major controls for Bread Boss. The clock shows you the current time and a list of alarms. The control on the left switches to night time mode, by shifting the alarms down the screen and only showing the time. This allows you to use the clock as an alarm clock. 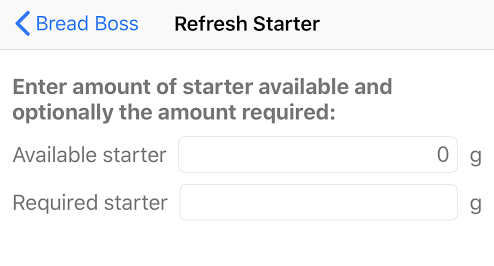 Enter the amount of starter that you have available and click on Done and instructions will appear to show you how to refresh your starter. If you want to increase the starter then enter the amount you need in the ‘Required starter’ field and click on Done and instructions will appear to show you how to increase your starter to this amount. Unit system – Metric, Metric with °F or Imperial. Always show loss factors – on/off. Plus loss factor (adds an extra percentage to the recipe to ensure that dough lost in the making of the recipe is compensated for) and Plus bake loss (adds an extra percentage to the recipe when you bake bread as you can lose up to 10% of the weight of the bread). If set on then then these loss factors will be visible in the view mode for the recipe. Show all in final dough – on/off. 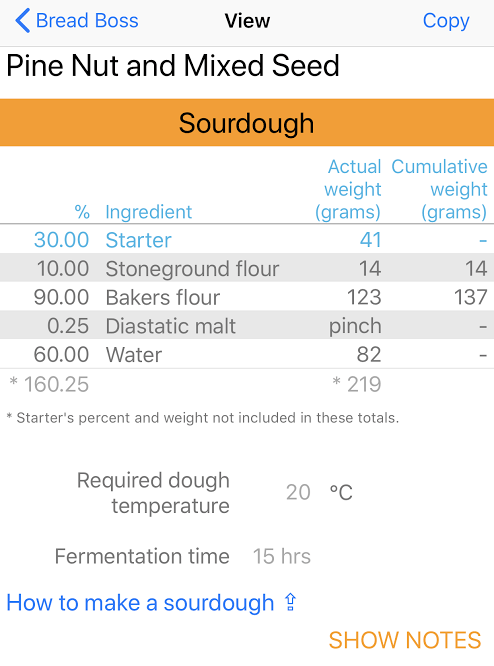 The base formula (or final dough) is a powerful way to see at a glance all of the ingredients and stages in a recipe. If an ingredient is part of a stage then the amount will show as zero in the base formula but the actual amount will show in the stage. Appearance size – Show text as small, medium or large. 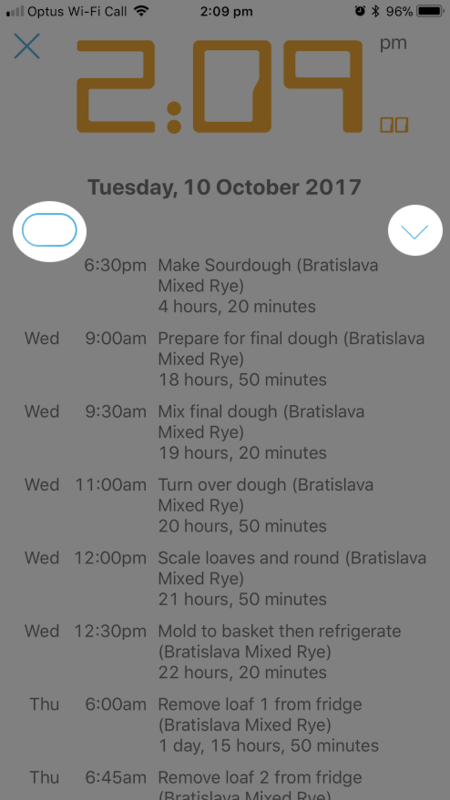 View screen timeout – stops screen from timing out too quickly when making bread, defaults to 30 mins. Scroll the list of recipes and select the one you’d like to make. When you tap on a recipe it will be presented in View Mode. 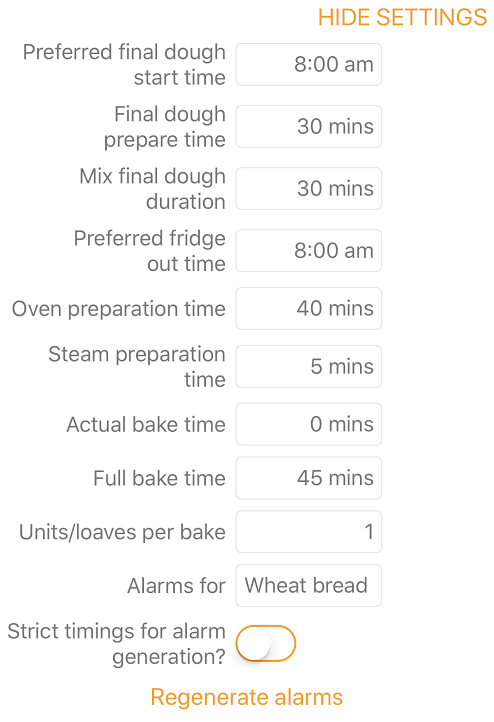 In View Mode you can change recipe settings such as the amount and size of your bread loaves as well as control the alarms. Note that if you want to change the ingredients and/or their proportions then you will need to edit a recipe. Supplied recipes cannot be deleted or edited but if you want to change the ingredients you can select the recipe and then copy it to make changes. Click on the … to get the list of actions available from the recipe. Once you’ve created your own special recipe you can share it with other Bread Bosses via email. 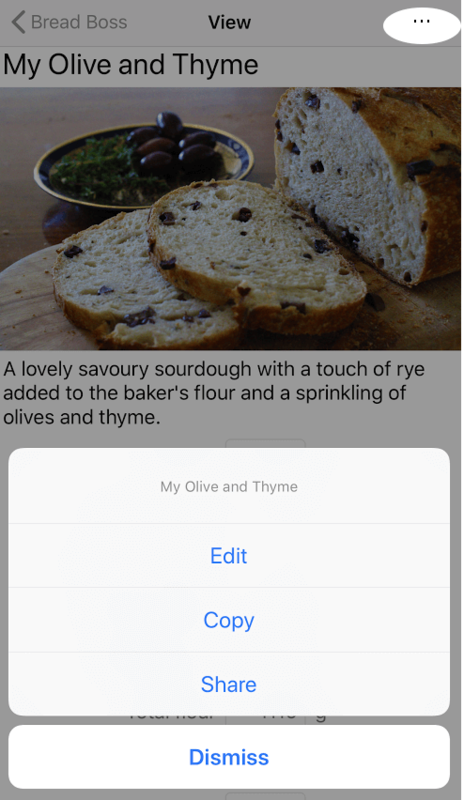 Clicking the share icon will convert the recipe into a .bbz file and attach it to an email that you can address to another user that has Bread Boss on their phone or tablet. When they receive the email all they need to do is click on the attachment and the recipe will open in Bread Boss. You’ll see an image of the bread for the recipe followed by a detailed description. 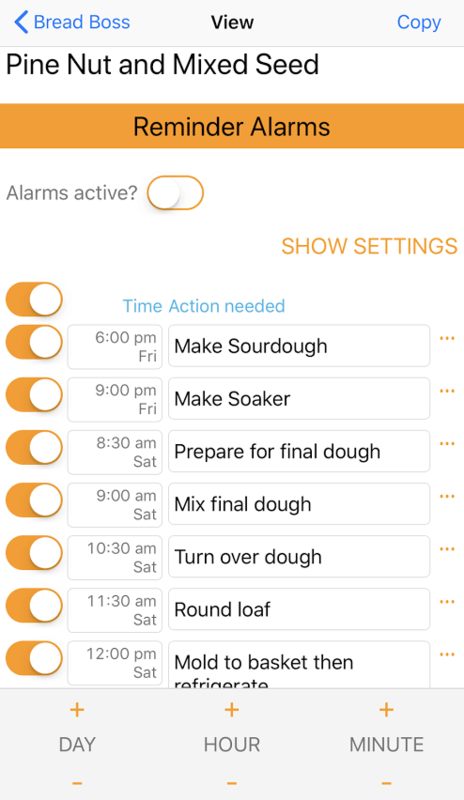 As you scroll down you’ll see recipe settings, dough making stages and at the end reminder alarms. Lets work our way down the screen. Double tap on any label to get an explanation of what it represents. Unit size – the weight of the dough. 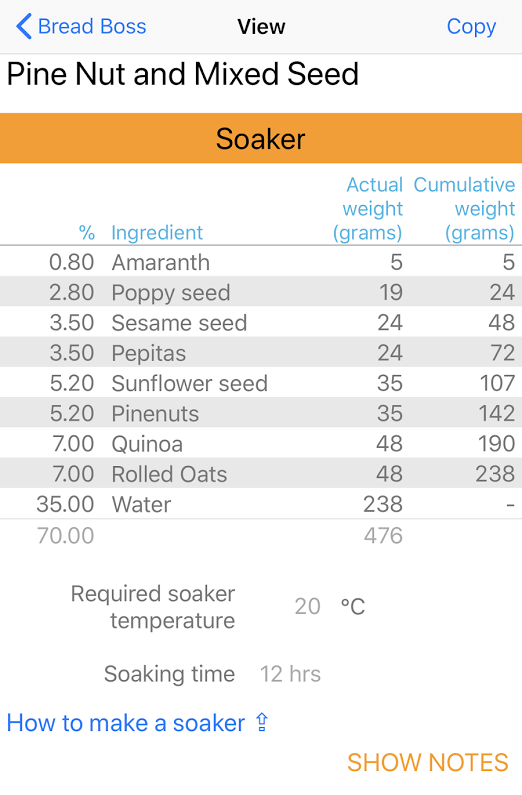 Scale unit size – how large you want to make your bread. Note that the system of weights are controlled in the settings. Number of units – how many loaves you want to make. Plus loss factor – enter the percent amount that is usually lost during the production phase of the dough. This amount will be compensated for in the calculation of the total flour and will ensure that your final dough yield will be sufficient to scale all of your desired units to the correct amount. Plus bake loss – enter the percent amount that is usually lost during baking. This amount will be compensated for in the calculation for the total flour and will ensure that your final dough yield will be sufficient to scale all your loaves to achieve the correct weight. Total flour – If you only have a certain amount of flour then you can enter that in the Total flour field and Bread Boss will adjust the Unit size to best achieve the Number of units you’d like to make. Required starter – shows the amount Bread Boss has calculated that you’ll need to make the desired Number of units at Unit size. If you click on the How to make a starter link you will be taken to a web page showing how to make your starter from scratch, using wild natural yeasts and micro flora. Available starter – allows you to tell Bread Boss that you have less starter than is required. Bread Boss will use the amount you have and insert an additional dough stage into the recipe. This will increase your starter to the required amount. Variation – recipes can have variations designed into them to cater for different climatic conditions under which the bread is made, or for alternate ingredients. The supplied recipes have variations that work best for summer and winter conditions. You’ll have to experiment to find what works best in your part of the world. 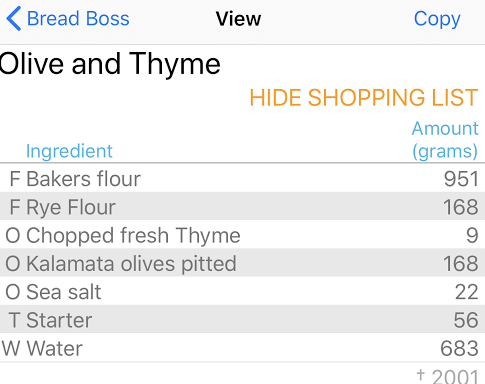 If you tap on ‘Show Shopping List’ you are presented with a list of all of the ingredients, their type and amount. When including grains and various non-flour ingredients into bread, a soaker stage is needed. This allows the ingredients to soak in water, hydrating and softening the ingredients. For example when using kibbled wheat in your grain bread, it will need up to 24 hours of soaking in water to soften and fully hydrate. If you don’t fully hydrate it then the bread will have poor mouth-feel and poor keeping qualities. The grains also will remain hard, it’ll be like gravel – it could end with a trip to the dentist. Whenever you see text like SHOW NOTES aligned to the right of the screen, you can click on it to expand or collapse a section with more details. For example to show notes for a stage. Use the How to make a sourdough link to visit the page explaining how to make a sourdough. You’ll use the ingredients in the recipe to make the sourdough. Adjust the water temperature to ensure that the dough starts at the Required dough temperature. Once completed, cover the dough and leave in a warm location away from draughts and direct sunlight to maintain the target temperature. It will need to be left to ferment for the duration of the Fermentation time specified in the recipe. Remember you can click SHOW NOTES to show you quick instructions for that stage of the recipe. 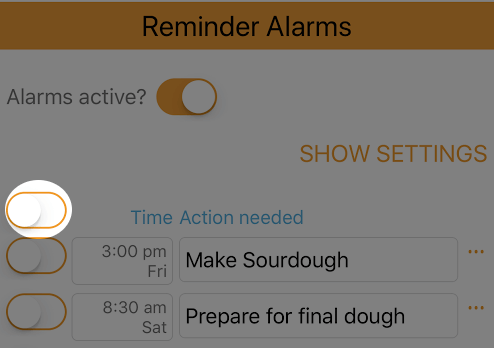 Remember to click SHOW NOTES on the supplied recipes for a reminder of the list of the actions required. Required dough temperature: this is a target temperature for the completed dough. To get the optimum fermentation for the specific recipe the dough should finish development at this temperature. You can also copy, delete an existing alarm or set it as the first alarm, by clicking on the … to the right of an individual alarm. With the alarms have been adjusted to your personal schedule, click on Alarms active? to activate the alarms for the recipe. A notification will appear in the notification bar of your device indicating the next alarm to trigger. Select which type of alarms you need to generate. The options currently supported are Wheat bread or Rye Bread. This setting will determine whether the dough would be turned during bulk fermentation. After selecting a recipe click on … in the top right corner and select Edit. For copy or add of a new recipe you’ll initially start with the cursor in the recipe name field. Enter a unique name for your recipe. If you want to set an image for the recipe then click on the thumbnail image beside the recipe name and you’ll be presented with images on your device. 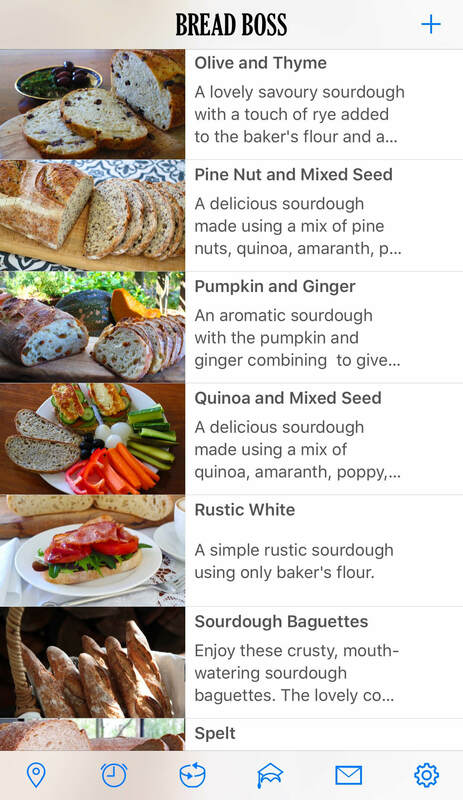 You can select multiple images to create your own image gallery associated with your recipe. Below the recipe name you can enter additional description or notes. These fields are shown in the recipe list and help you to remember what the recipe is about or any special requirements you’d like to remember to do before you use it. This is especially helpful if you are planning to share your recipe; you can enter information that would not be obvious to your fellow Bread Bosses. This display only field shows you what weight you need to scale each loaf, roll or bun. When you specify a value for Plus Bake Loss, the scale unit size is shown indicating the required weight for each unit to achieve the final unit size. When your dough is baked the final product will weigh less that the amount that entered the oven. This shortage is referred to as the bake loss factor and if specified for the recipe, will allow you to account for the loss by presenting the amount to scale each unit. You can also vary this when in view mode. The amount of starter required for this recipe. You can enter the amount of starter you have and if it is not enough then an extra stage will be added to the recipe to increase the starter to the Required starter amount. You can add this in view mode. The Variation shows you what the name of the current variation of the recipe is called. Click the … Copy to create a new variation. You can chose to enter the ingredients as percentages or weights. The base formula must contain ALL the ingredients of the whole recipe, including those ingredients that may only be used in other stages. When you look at the base formula you can see the whole recipe and what it contains. Stages will naturally sort to the top of the list, followed by flour or seed ingredients, other and finally water. 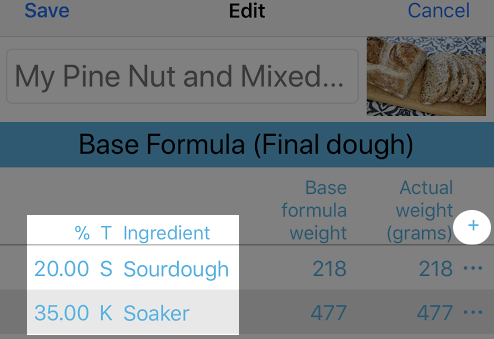 Add the ingredient name and then tap on column with the heading ‘T’ for Type and if you are entering percentages tap on the % column to enter the percentage, if you are entering in weights enter the Base Formula Weight. F – Flour or seeds – flour or seed ingredients are the fundamental ingredient from which all calculations are made. All flour or seed ingredients are treated in the same way, regardless of the name. Flour must be consistent across all dough stages. Thus if you have ‘bakers flour’ in the sourdough then you will also have it in the final dough. You’ll see messages appear as you enter ingredients indicating any errors, don’t worry about these until you’ve finished entering all your recipe ingredients, then you can fix the details as highlighted by the error messages. G – Sponge – a stage similar to a sourdough stage but instead of using a starter you are using yeast. N – Non-dough – an ingredient that is used in a production stage but not used to influence dough calculations. For example the sesame seeds sprinkled on the top of a dough before the loaf is placed in the oven. S – Sourdough – a stage where the sourdough starter is added to flour and water to leaven the dough to the point where there is enough leaven to add to the final dough. This can then be edited just like the base formula (final dough) stage. T – Starter – a starter ingredient represents the initial culture to be added to a stage. Starters can only be added to a sourdough stage. Bread Boss automatically calculates the dough amounts such that the starter is again removed from the stage before being incorporated into the final dough. K – Soaker Stage – this is a special stage designed for ingredients that need to be soaked in water for a period before being added to the final dough. Soaker stages can only be added to final dough stages. P – Production Stage – a production stage is a convenience for timing other activities needed for the complete production of the bread. For example if you were making a Ciabatta or Pan Francese you need to prepare some water, olive oil and salt for a double hydration process. This can be specified in a separate production stage scheduled some time before starting the final dough. Y – Yeast – if your bread is not a sourdough or you are just including a poolish stage then you can add a yeast ingredient. W – Water – like flour, water is a fundamental ingredient and must be present. O – Other – all remaining ingredients are treated the same and have no special requirements. In bread manufacturing all ingredients are specified as a percentage of the flour weight. Thus if you enter a percentage value of 10 then the ingredient’s weight will be calculated as 10% of the total flour weight. 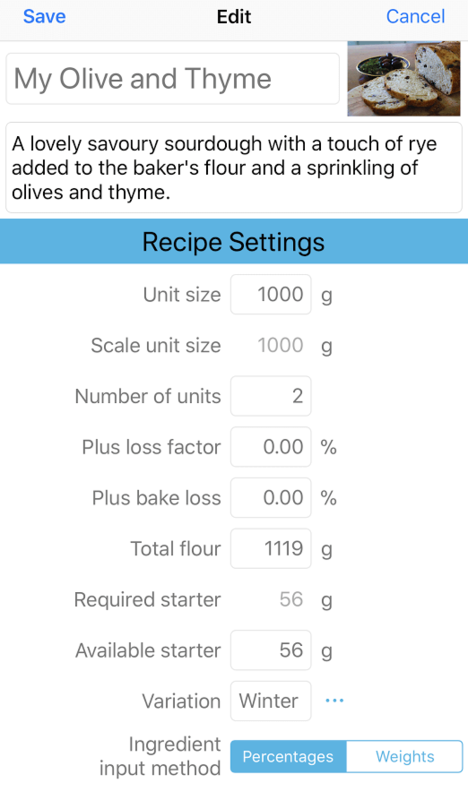 Remember that the total flour weight is set in the recipe settings via the unit size and the number of units. Thus depending on the amount of bread you are making the weights will be adjusted using the entered percentages. If you are converting a cooking recipe to a bread recipe then you need to ensure that you have all your ingredients expressed as weights. Thus you would need to measure out any volume specified ingredients and then weigh them. 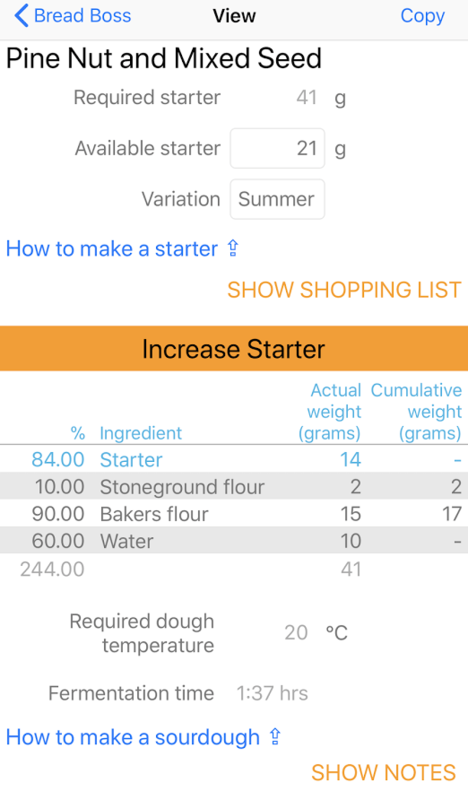 Once you have all the weights Bread Boss will convert the recipe to a bakers formula, showing the percentages. 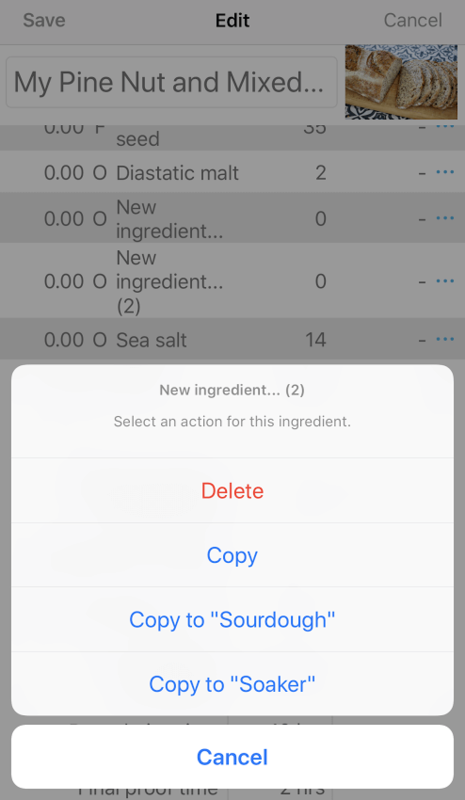 You can press on the … next to an ingredient to get the actions available, for example delete it or add it to another stage in the recipe. This is the temperature at which the dough, soaker or mixture needs to be for this stage. Depending on the conditions in your specific environment you may need to use warm or cool water to help achieve the required temperature. This allows you to set a specific water temperature to use when making the dough. This is a brief intro on how to add a recipe from scratch. Use the + in the top right hand corner of the list of recipes to begin creating the recipe. This will actually create a copy of the Rustic White recipe so you have something to start with. Enter the recipe name, which must be unique. Select Percentages for the Ingredient input method. Now using the + in the top right hand corner of the list of ingredients, add all of the ingredients to the The Base Formula (Final dough). This allows you to easily see all of the ingredients that make up the final dough. The one exception is that the starter will only appear in the Sourdough stage as this is normally taken out of the sourdough before it is added to the Final Dough. Now add the stages, the sourdough stage will already be there but for example if you have a soaker, add the ingredient Soaker with a type of K – Soaker stage. Then select the menu … and select the action Copy to a nameofstage to copy the ingredient into a stage. Now scroll down the stages and make sure all of the ingredient and percentage amounts are correct. Refer to the section on Editing a Recipe for definitions of all of the fields. When creating a formula normally you would use percentages to enter the ingredients. However there may be times when you have a recipe that you would like to recreate in Bread Boss and you only know the weights of the ingredients. The following steps will show you the best approach to inputting a formula using weights. 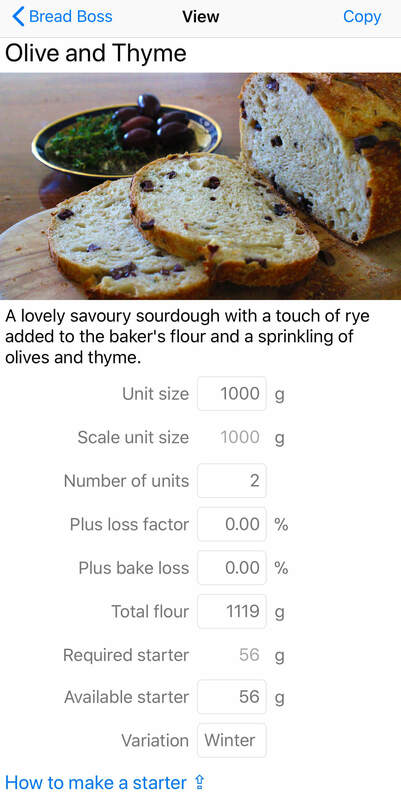 Enter the Recipe Settings of Number of units (how many loaves you want), don’t bother entering Unit size as this will be determined by the weight of your ingredients. Select Weights for the Ingredient input method. Enter all of the ingredients and their total weight in the Base Formula. If an ingredient is in multiple stages then total up the weight amount and add this to the Base Formula, for example if bakers flour is 120g in the sourdough and 240g in the final dough, then add 360g to the Base Formula. You can fix up the amount in the stages later. We just want the Base Formula to contain the total amounts for the bread dough. Note that the starter will only appear in the Sourdough stage as this is normally taken out of the sourdough before it is added to the Final Dough. Enter the stages to the Base Formula, a Sourdough stage will already be there but if you have a soaker add the ingredient Soaker with a type of K – Soaker stage. Then select the menu … and select the action Copy to a nameofstage to copy the ingredient into a stage. This will copy the ingredient and full weight amount to the stage. Now scroll down and check the amounts for each of the stages. If an ingredient appears in multiple stages fix up the amount so that it is correct for that stage. If you look at the recipe in Edit mode or hold it horizontally in View mode you can now see the percentage of each ingredient of the recipe.